You wouldn’t believe how the cold dark winters evening simply fly by here (well at least I managed to get home even though 4″ (100mm for the metricians) of snow fell this afty, the first November neige in Geneva since 1980 allegedly). And its still dumping it down – might have to throw a sickie tomorrow and go sledging with the kids. Anyway the big argument today was test code. Should you or should you not put your VBA test code into production? Should you strip down your project to the absolute minimum clean prod only code? My vote is to leave it in, and even though I was in the minority at school today that doesn’t mean I’m wrong, yet. It helps when you are trying to fix something later in production at a users’ desk. If you make significant edits to your code you should retest, if that edit was removing what you thought was the test code how will you check you haven’t broken something? add a test harness??? What do you think? what am I missing that these clean code freaks can see? Remember I’m not for a minute suggesting leaving in a load of random junk scattered throughout a project. I’m thinking of separate modules or at least sections with a bunch of meaningful tests that exercise the main functionality of the system in a controlled way. Just in case you thought the most serious biscuit issue of our time was whether jaffa cakes are a biscuit or cake, look at this. If their figures are to believed (and why should we?) 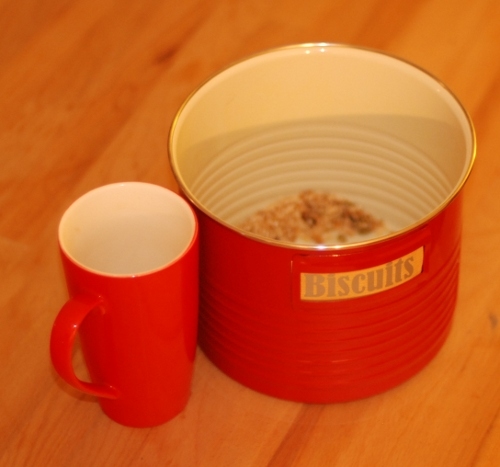 nearly half of us have suffered a biscuit injury. Presumably excluding fat-knacker-itis. I’ll fess up to scalding my tongue dunking rich teas, but of course its illegal to eat them dry, not to mention close to impossible. And the mess left if they drop into your Yorkshire tea is the slime whose name we speaketh not. 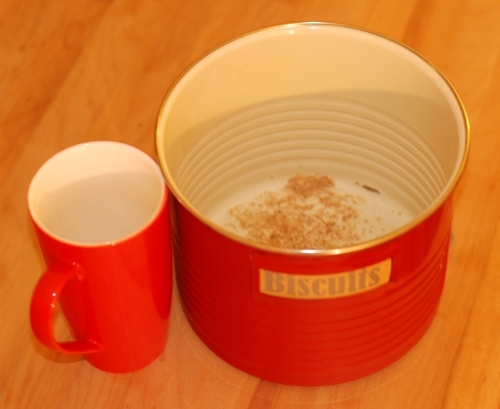 Whats your worst biscuit related injury you can talk about on a public blog? In amongst all my other busy-ness I have been reviewing a few Excel developer tools, or in some cases Office developer tools. Addin Express is definitely more of a general Office development tool than Excel specific, but it does create xlls which was my main motivation for the tool reviews. 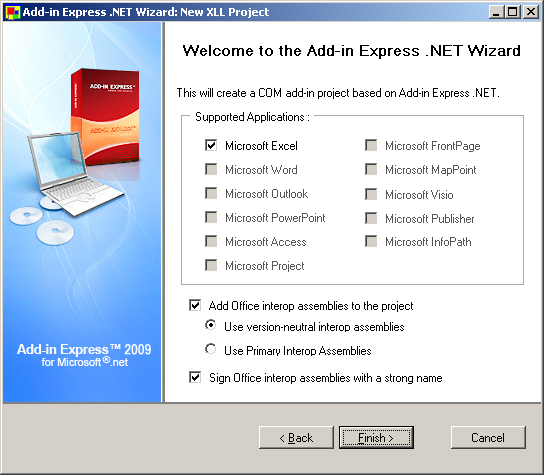 Addin Express (which I will call ADX from now on) has been recommended to me by several of my Office developer buddies, so I was keen to try it out. 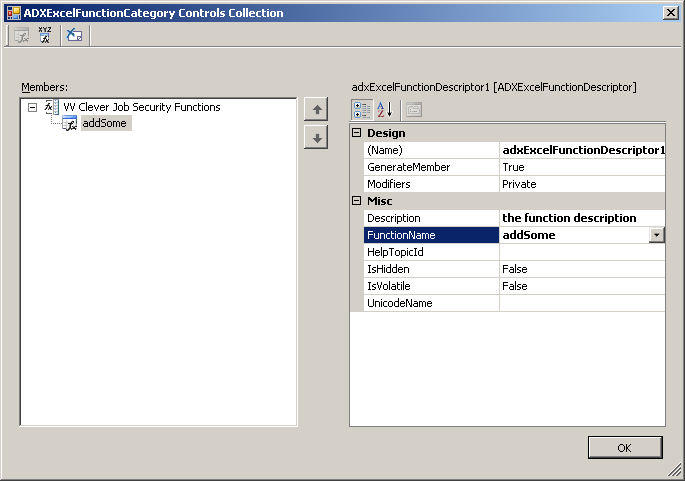 For anyone who was at the UK Excel developer conf in London in July you might remember that I demoed creating an RTD function using ADX and it is very simple. As I said my main initial interest was xlls, and so thats where I’ll start. 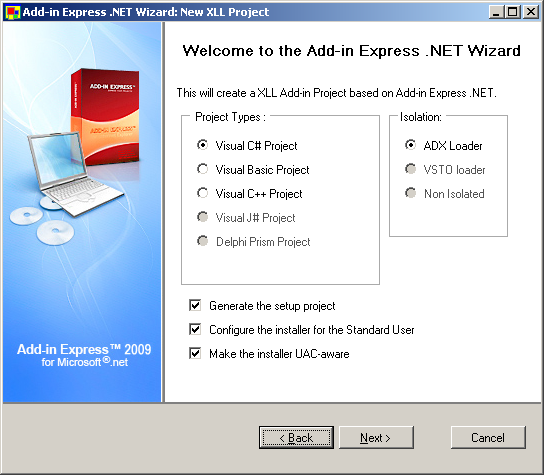 ADX has a novel drag and drop approach to xlls, but before we get to that, when you create an xll project you get to choose which language from VB, C#, C++, J# (remember J++?? ), or Delphi. And on the first dialog is where you get the first hint that an ADX xll is not like an XLL+ xll for example, it will need a proper install (setup project). There is some serious COM/.net plumbing magic going on in the background. The big point to note here and one of the biggest appeals of ADX (IMO) to an add-in developer is the ‘version-neutral interop assemblies’ choice. 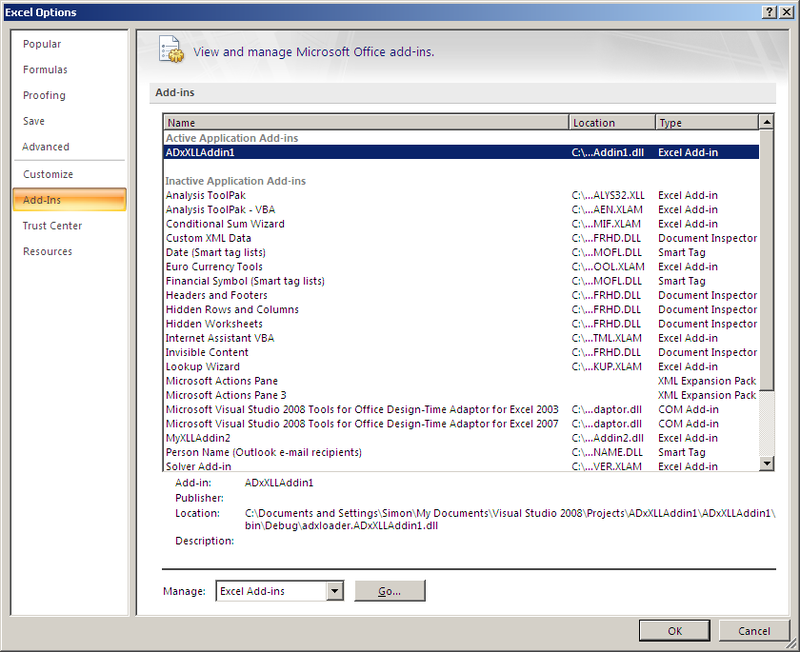 That gets you the ADX IA’s which allow your .net code to work with any sensible version of Office. I’ll talk more about this later because, we would expect an xll to work with every version of Excel since 97 anyway. For a hand coder like me its all a bit novel, but for a more normal, visual developer I think it would be far more second nature. When you open the toolbox (there’s a clue – I never use it, as I never do UI development). Here you will see a region titled ‘define your UDFs in this section’, which to be fair sounds like a pretty good place to define a function. Inside is a sample function you can uncomment or just copy the principles from. Its pretty easy, none of the C++ data type pain, use standard .net data types and ADX will do all the marshalling for you. Its a static class so you can either define all your functions as static now or wait for the compiler to tell you to later . That’s C#, without wanting to start a fight (much ;-)), I think VB.net is a lost cause. Nothing wrong with the technology, I just think its future is somewhat less certain than C# or C++. Anyway from an ADX pov we now need to get this function visible in Excel correctly, and for that they use some drag and drop GUI loveliness. Double click or right click the XLLModule.cs to view its designer surface, then right click that and ‘add an Excel function category’. You now have a button like thing whose properties you can set as if it were a button, mine is called clever functions. This is the function category you will see if you click the Fx in Excel, so its worth doing something notable. To this category you then assign your functions, this is a good hierarchical approach to building out the functionality of a non trivial add-in as you may want to categorise your functions into usage groups to make it easier for user to find and use your functionality. You add you description then assign the functionName (from those functions you already coded in the XLLModule class) that you are talking about. If you have a help file then you can connect the function to it here. Hidden and Volatile are best left as false. You can repeat this process until you have all the functions you want to expose to Excel in the left hand pane of the dialog above. The next step is to explain the detail of the parameter of all these functions. The order you do it is not important, but you right click on a function in the left hand pane and choose Add Function parameter. You have now defined a function that takes 2 doubles and returns a double. The current implementation in the old C# just adds them but we can change that later without going through all this interface stuff. 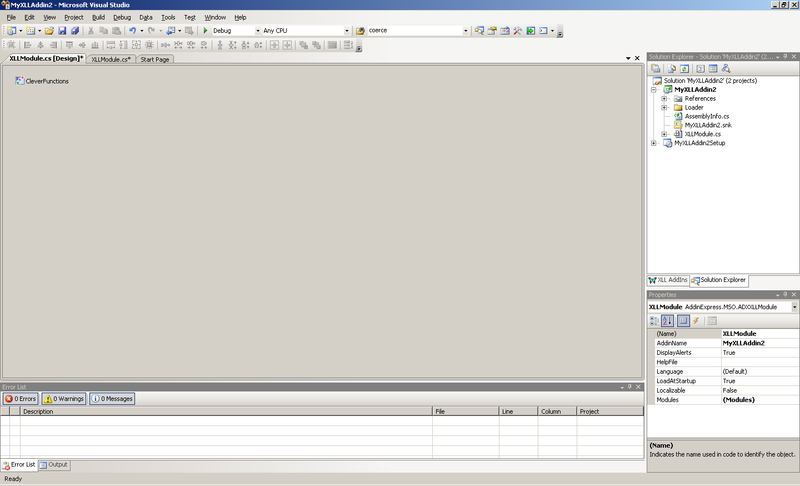 When you are happy with your functions and want to try them in Excel you need to build and register the add-in. Build, Fair enough create some binary thingymabob, register? Well, these ADX xlls, as I mentioned before are not ‘pure’ xlls, they need some registry magic to work correctly. Click Build>>Register ADX Project to set up the registry side of things, from now on you just need to rebuild as normal. When Excel starts your xll is loaded automatically, no security warnings, no searching in \debug to load it manually, and all the functions are ready and available. Actually when you look in the add-ins list in 2007 (assuming you are (un?) 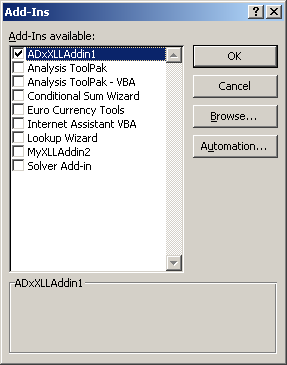 lucky enough to working in ‘Excel Vista’, you will see the add-in is actually a dll, although ADX exposes it as if it were an xll/xla(m) one. IE its in Tools>Add-ins rather than COM add-ins. In my very limited testing I reckon that an ADX xll is about 3 times faster than VBA, which is pretty reasonable. It was close to 5 times slower than my test raw C xll which isn’t so brilliant. I will add reviews of the other feature as I get chance to investigate. I can’t leave though without a little moan about the ‘getting a copy of Addin express’ process. I downloaded the trial, with the plan of installing it and reviewing it at the airport. I was somewhat fed up to find that you can’t install it without a key that you need to download. Without a wifi connection that meant I had to buy a mountain bike magazine to fill the hour wait instead. I’m not sure what chance I’ll get to look at other features as I wrote version one of this review several months ago, and I think my trial will have expired by now. An ADX xll is a bit more effort to deploy than a native code one, and the performance is not as impressive. But it does offer easy access to the full COM OM, unlike native code xlls targeting the C API only. The choice is yours though really, ADX is easy to work with, version independent, targets all add-in technologies and all Office products, shows a significant performance improvement over VBA, and is reasonably priced. 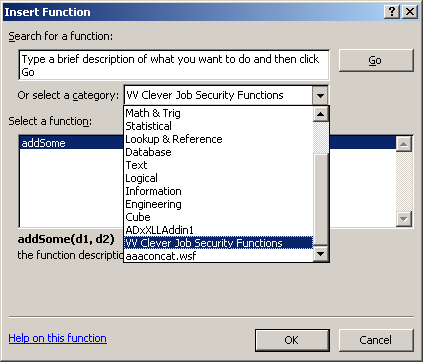 And offers improved security of VBA, which seems to be a fairly common question I get asked at the moment. I think its a very valuable tool that every serious Office developer should have in their toolbox. You can download the docs here, they don’t really do a trial version, but you could try asking if you are serious. I know lots of you are already using Add-in express, what are your views/experiences? I mentioned in a recent post about some hassles we had with RTD. Here is a bit of background. In a daily reporting environment it’s pretty common to use =NOW()-1 or better still =TODAY()-1, or even better still (in 2007 anyway) =WORKDAY(TODAY(),-1) to get yesterdays date to run your close of business reporting. All of these are volatile, and in the grand scheme of things that’s probably not a massive issue. They are volatile because they have no way of checking if their inputs have changed, mainly because they don’t have any. So they have no choice but to calculate each time Excel does. Unfortunately volatility is like a virus, a bad one, oh I don’t know, like say that flu bug that sir cough-a-lot at the desk next door has. Every function that depends on a cell that contains a volatile function becomes sneezy volatile. 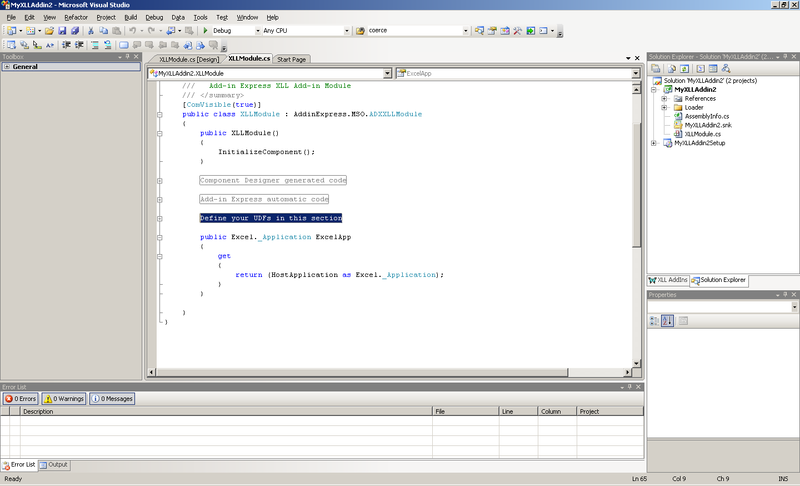 I created a xll udf, that takes one parameter that it ignores completely, that logs each time its called. I pointed it a static cell, change an unrelated part of the worksheet and the function is not called. I take this as evidence that my udf is not naturally volatile. I then enter = NOW() in that precedent cell, now any change anywhere in that excel session causes =NOW() to update, which causes my udf to log another call. My udf argument is declared as an integer (J) so the bit of =NOW() that makes it into the function never changes, but unfortunately Excel is not checking that level of detail and calls my udf anyway. I also checked about 20 levels of indirection and got the same result – the whole stack becomes volatile. It might only infect udfs, I don’t know, I’m not sure how I could reliably test native functions, any ideas? None of this is a catastophe until your function return causes a recalc – exactly what RTD does. XLL PLus to the rescue again. So one solution is to avoid calling RTD if the inputs haven’t materially changed. And this is exactly what you can do with a couple of clicks in XLL+. You just click the ‘cache results’ checkbox and first time through your RTD version will call, next time XLL+ will take the value from the cache without calling RTD, no return, no recalc – problem fixed. I’m sure there are plenty of other ways around this, but fundamentally I think in Excel 2007 they will all depends on the principle of avoiding that second RTD call by checking nothing important has changed since the last time that function was called with those parameters. Or mandating that users don’t use volatile functions as input parameters (good luck with that…). I wonder if a more finely grained volatility is needed? something like the throttle that RTD already has but maybe update every hour or something? But then would you have different levels of volatility, how would you tell Excel the update frequency? Perhaps Excel could always check the first argument of volatile functions as use it like a timer? I don’t know the answer but as it is in Excel 2007 the RTD implementation is pretty fragile, I think. Unless I’m missing something? Anyway another big thumbs up for XLL+, the more I use it the more useful I find it. Have you experienced this issue? Any suggestions? A better way to get some asynchronousicity into Excel udfs?